Making a milkshake in a blender shouldn’t be so hard. After all, shakes are a little bit of happiness in a cup! We want to help you make them with the best blender for milkshakes. Me and my grandpa love ice cream. He was the one who taught me the fine art of treating yourself to a nice strawberry shake with two juicy cheeseburgers for dinner once in a while. Once, we went to an ice cream stand together. I was very small, maybe five years old. He bought the biggest shake they sold. We stuck two straws in and sipped together, laughing at funny jokes. I remember telling my grandpa about riding my bike. I just loved that moment and I still go back to it once in a while for a smile. Now that I am all grown up, I desire to make my own shakes at home. There are all sorts of cool combos you can do right in the kitchen. Have you ever had a choco banana shake? How about a birthday cake milkshake? All these wonderful creations can be yours and more when you get your very own milkshake blender. Stay with us! How Much Power Do I Need? : The more power, the faster the milkshake machine will turn. This is ideal if you have a big group to make shakes for. If you’ve got kids, you probably want to get their shakes to them quickly. If you like to entertain or have friends over for dinner, it is a good idea to get a blender with power, so your guests are never without a frosty drink in their hand. How Much Of A Blender Jar Do I Need? : Be sure to look at blender size. If you live alone or with a spouse, a small blender jar will do. But if you’ve got kids, friends who come over often, or a desire to make really big shakes, go for a big blender. You may even consider getting a commercial grade blender so that you get a big jar you can fill and serve with ease. Do I Want A Retro Look or Is A Modern One Okay? : Some of the milkshake blenders we look at are very cool and retro-inspired. Others look like regular blenders. This is fine and doesn’t take away from the ability to make great shakes, but you have to choose one that matches your kitchen and taste. Examine the features of each and decide what one you like best. Be sure to take a look at the color and construction of each blender. Make sure to measure your kitchen cabinet space so that your blender will fit and be comfortable when you use it. This hand blender does so much for you! This Mueller Ultra-Stick can help you make delicious eats like cheese sauce, salsa, pesto, hollandaise sauce, whipped cream, Indian foods, and even soups and cake. That’s not even all the stuff it can help whip up. So, this one definitely does more than just make great shakes. The product features on this great little blender are excellent, too. The immersion blender is compact, fits anywhere and takes almost no space up in your kitchen. This is great for those of us in small apartments or kitchens that are shared with roommates. The blender is super versatile, as we mentioned earlier-you can make just about anything with it and prepare sauces and such for each and every meal. The machine itself is very affordable and can blend most things up in just thirty seconds. It is a lot easier to handle and hold than a countertop blender. Lastly, the blender is easy to clean and care for. All you have to do is rinse the machine with water or put it into your dishwasher. 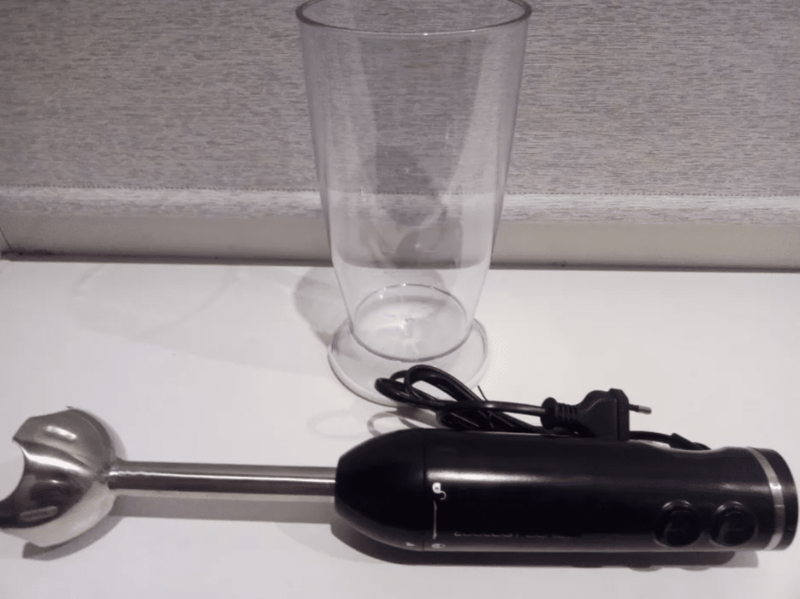 So, this powerful 500-watt kitchen tool is going to whip up the nicest, fluffiest immersion blender milkshake you ever had. You could even put in some goodies like sprinkles, chocolate chips, peanut butter or berries and blend them up for a shake you will really love. But you can’t drink shakes for every meal, so you can also use this blender to beat eggs for breakfast, re-blend peanut or other nut butters for sandwiches, or even puree up your favorite fruits and veggies to make applesauce or some smooth, spicy salsas that go great with tortilla chips and tacos. Super strong motor. Users report it feeling very powerful when being used in the kitchen. Handheld immersion blender is much more convenient and easy to store than a countertop blender. They are also easier to use in your cooking. Another reported that it is a joy to make bulletproof coffee with. Bearing for blade attachment is not adequately lubricated, creating a high-pitched whining sound when running the blender. Some reported that the electric cord that powers the blender wraps around the bowl, arm of the person operating it, or whatever else might be standing on your counter. Thicker mixtures like brownie batter can be difficult to handle. If it is power that you seek in a milkshake blender for home, you have come to the right place. This is a commercial milkshake blender designed for heavy workloads. This blender may have the power the food industry requires but will not take away from the beauty of your kitchen. The slick stainless-steel base combined with the sharp looking black accents on the machine will match any and all decor choices of kitchens everywhere. It is an 18-inch-tall blender, however-so do measure your kitchen cabinets and any other area you’d like to keep this blender to ensure it will fit. This commercial blender, of course, is a dream when it comes to making milkshakes. But it can do much more, and with power. The motor comes in at 1500 watts and operates with 6 metal-drive stainless steel blades, so whatever you put in there is going to be smooth and easy to drink. You can even make stuff like baby food in here for your little one. You can puree up foods for family members who need their meals in liquid form. Soups are a cinch in this blender-just pour in the ingredients, blend it up and enjoy the nice smooth texture of your meal. The variable speed control provides multiple speed settings that you can adjust with ease and set at any speed you desire. Smoothies, shakes, baby foods and anything else you want blended up become an absolute breeze with this amazing tool. The product specs indicate that the blender operates on 120 volts, and weighs 12 lbs. The blending jar is perfect for big families or groups of friends. It is 68 ounces, or 8 cups of capacity. 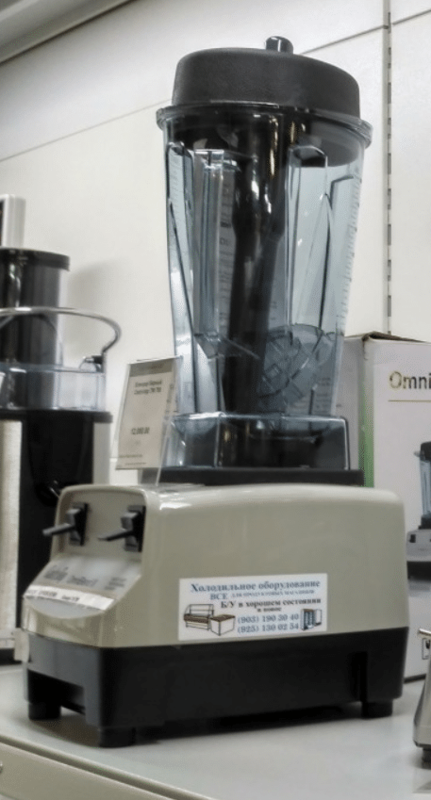 Everybody will be getting their fair share of a shake when you use this blender. The copper motor has overload protection, making the operation a little safer. 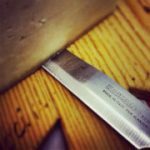 Blades operate at 28,000 RPM so all ingredients are blended and pulverized. The pulse feature can help you crush ice in a hurry, so you can make cocktails or slushies for the family fast! The cleaning of this machine is a joy. All you have to do is add a few drops of your favorite dish soap and some hot water halfway in the blender, and then run it for 30 seconds, rinsing afterward. It’s so easy and fun to use it, and simple to clean, too. BPA Free blender jar, for a safe and chemical-free food and shake prep experience. 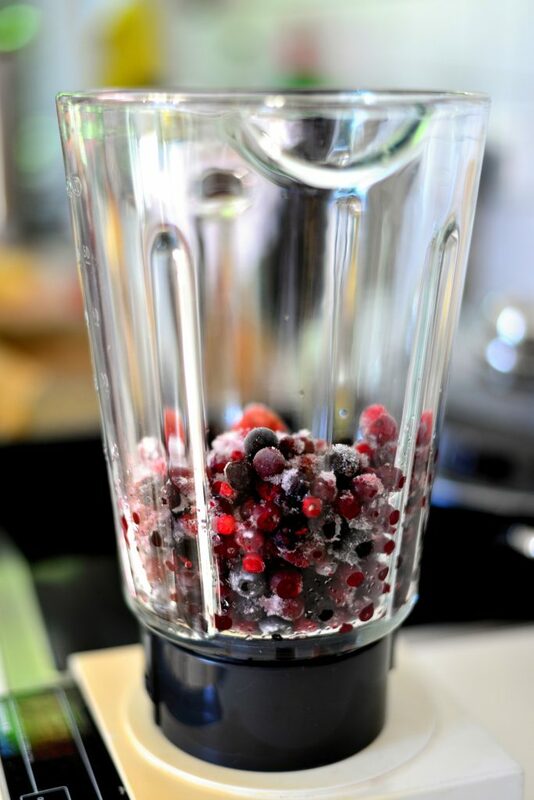 Blender is approved by the FDA if you seek a blender certified by a reputable organization. Copper motor will prevent overheating. Cannot blend oats into a flour very well. A commercial blender will presumably be louder than a home-approved blender. Beware if you are in a home with light sleepers or roommates. 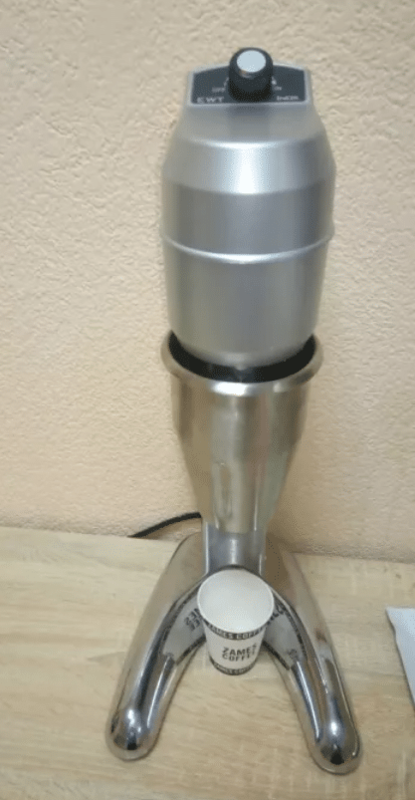 Manufacturer does not sell parts for the blender. This would likely have to be acquired elsewhere. Okay, maybe I am being a little biased here. But wow, this one looks the absolute coolest out of all the blenders we are looking at today! 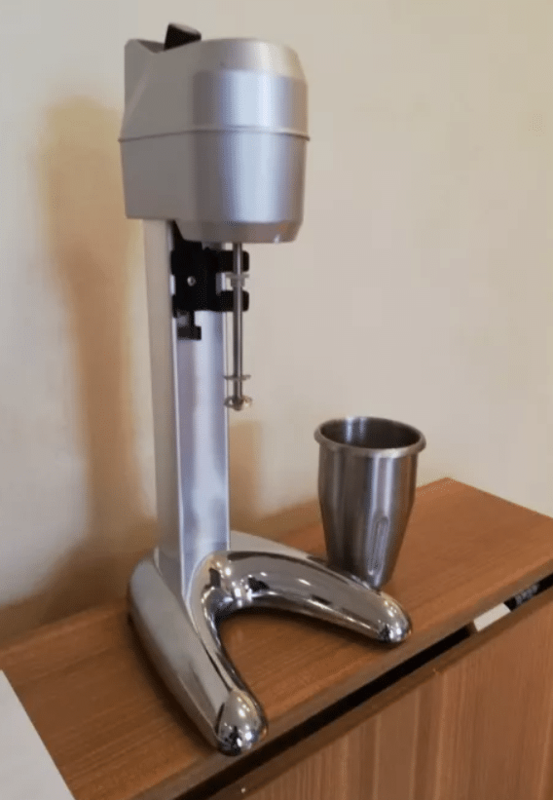 At first glance this old-fashioned milkshake blender looks like something you might see in a 1950’s television sitcom where the teenage kids would sit at the counter while a kindly soda jerk served them their favorite after school treats. It is super cool and stylish and would look the best in kitchens that have that retro decor going on. But enough about that. This blender is useful no matter what kitchen it is in. The all-metal construction is very professional looking and slick. It is very easy to simply take a wet cloth and wipe it down after use, or when a little dust gets on it. The metal looks durable, and actually is. It’s a great choice for those of us that do not care for plastic on our appliances. 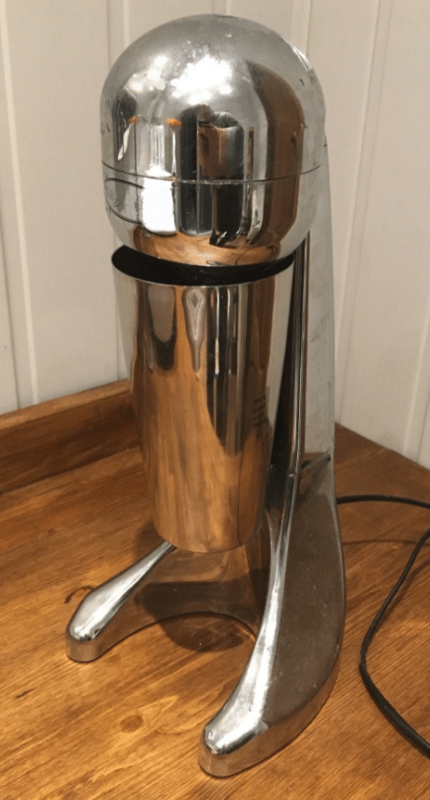 Hamilton Beach has been making drink mixers since the year 1911, and the housing is die-cast aluminum with a commercial-grade mixing spindle complete with two agitators for good measure and easy blending. The blender has two speeds, and a tilt-back head. This will get you the nice old-fashioned malts or shakes you remember from years ago, and even some nice soda drinks too. Everybody can pick what mix-in they want – fruits, chocolate chips, or syrups will blend well with this machine. Just start by putting in your favorite ice cream and milk into the stainless-steel cup, then add whatever extras you care to have in your shake. Get creative! We crumbled up cookies into our shakes once. This blender also handles batter quite well, making pancakes a breeze. You can also add eggs and vegetables to the cup, blend it, and pour the mixture into the frying pan for the greatest omelets ever. If you or someone in your family loves protein shakes, mix one up in this blender and taste how smooth and even it is. The mixing spindle is commercial quality, so you can be assured you will get a good blend every time. Cleanup is a cinch with this machine. The cup goes right into the dishwasher. The blender comes with a five-year warranty, so that takes some worry out of the picture in case something happens. This is one that blends function, beauty and toughness into one great package. You can buy extra mixing cups as well, so everybody can mix up their creations in their own vessels. Can make frappes with this blender-great for coffee lovers. Manual includes several great recipes for old-fashioned shakes and other drinks. This blender is lighter compared to older ones from the 60’s and 70’s. If the blade touches the side of the cup, it makes the sound of metal on metal-not very pleasant! You will need to clean the mixer off quickly after you take the tin cup off-or else ice cream drips all over your countertop. You might put a mat under the cup to catch any ice cream. Here is a stylish and cute drink mixer in the neat color of mint green. It is a quirky and fun little tool, but don’t let its look fool you. This Cuisinart means business. When you first see it, you feel like you are going back in time to the days of malts at the drugstore counters, sipping and smiling with your friends after school while rock n’ roll plays on the jukebox in the corner. 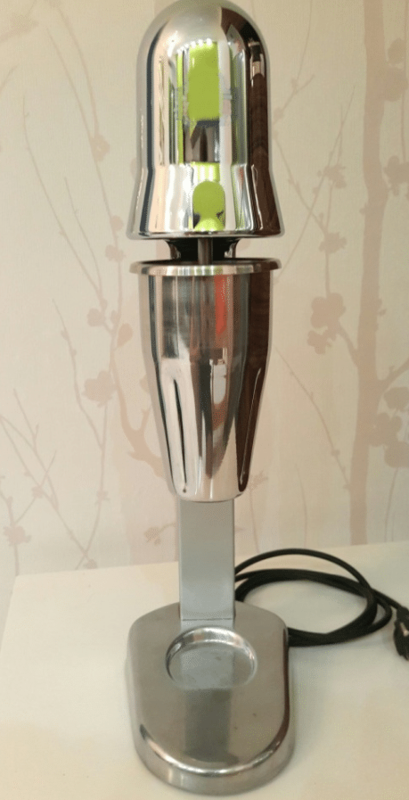 You will get the finest fountain shakes, sweetest smoothies and fanciest frappes you can dream of with this mixer. The mixing spindle is slender and smoothly blends your drinks to a fluffy, frothy consistency thanks to its great aeration disc. It comes with two speeds that will easily crush up your ice for those hot days that call for a refreshing drink or blend your eggs and whip up cream with no trouble at all. You can pretty much put any batter in here and it’ll mix like a dream! This machine is also nice and heavy, which is very pleasing to those of us that like a good, heavy piece of kitchen equipment. It is constructed of die-cast metal and features feet with non-slip material, so if you are clumsy like me it reduces the risk of it falling over. The motor is very heavy-duty, and it is enclosed within a beautiful chrome-plated cover. It will look absolutely gorgeous in any kitchen. Do not let the green color deter you-it’s what it makes that really counts. You can mix bubble tea in this! How cool is that-get the tapioca pearls ready and the extra-large straws! Assembled in the USA of good quality parts, and Cuisinart is a brand you can trust. One user reported using their machine for 15 years. That’s a lot of shakes! 18 inches tall when out of the box-may not fit on small kitchen counters. Measure first! Green color may not match all kitchens or tastes. The best blender for milkshakes is not far from your grasp with our helpful guide. No matter what your purpose is for picking up one of these helpful machines, you will be a star in your family. Everybody will know you as the one who can make the prize-winning milkshakes! If you were a child during the days of soda shops and malts, you can relive those fun days again when you pick up one of the cool old-fashioned milkshake blenders from our selections. Imagine sharing the fun of drinking those great tasting malts with your grandkids and getting them interested in the great taste. If you’ve never had anything other than chocolate, vanilla or strawberry shakes, get ready to try out new flavors you can make right at home. You can make it a fun family event by getting everybody their own cup and helping the little ones blend their own shakes. No matter what way you spin it, the possibilities are endless, and the smiles will be too when you get hold of the best blender for milkshakes. You can even make some homemade whip cream to top the shakes. Have fun and enjoy inventing some new flavors at home!